I have a very embarrassing problem that I'll share with you today. I struggle with body odor. Not because I don't shower, but because deodorant doesn't work very well with my body. Something will work for a few months and then my body starts to reject it and it's like wearing nothing at all. So I have to change my brand pretty often and go back and forth with the two brands that I know work for me. I try new brands and formulas pretty often and more times than not I throw said new deodorant in the trash after a few days. I signed up for the Dry Idea AdvancedDry deodorant review and giveaway because of this problem. I figured I had nothing to lose and everything to gain so why not? Well I am happy to say that the Dry Idea actually worked for me. It's still being used two weeks later which is pretty good for me. I was sent the roll on and I haven't used a roll on in over ten years. I have to say that I really liked it. And maybe for a weird reason, I like that I can see that I didn't miss a spot. I know it's a little strange but that's me. Thankfully, the formula is fast drying so I don't have to wait for too long to get dressed. And I really did stay dry and odor free all day. That is really all I'm looking for in a deodorant. But I'll give you some of the other facts too. 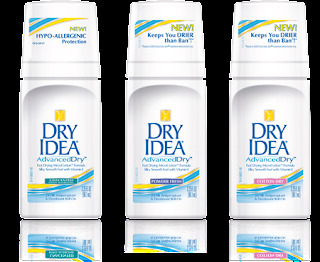 Dry Idea is hypo-allergenic, provides 24 hour protection, and contains Vitamin E.
Dry Idea is holding a sweepstakes with $1,000 in prizes! There is a $500 1st place prize and 10 $50 2nd place prizes. You can enter to win by visiting their website. And you can win a bottle of Dry Idea to try for yourself. 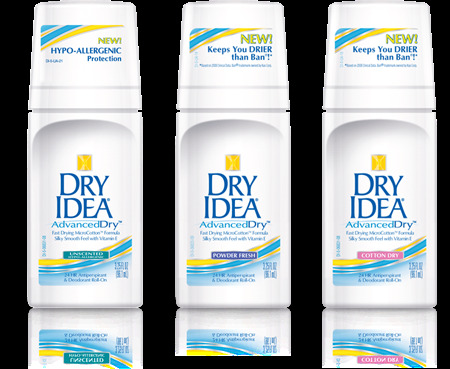 Three winners will receive a coupon to buy the Dry Idea deodorant of their choice. Only entries on the Rafflecopter form will count. Disclaimer-I received a sample of Dry Idea deodorant so I could review their product. No further compensation was provided and all opinions are 100% mine. I'm pretty loyal, until I find something that works better.